I love tunnels. Train tunnels, stairs, underground passages but you will already know that if you follow my Instagram feed. As Tara beat me to it with a Phuket picture I thought I'd go urban. 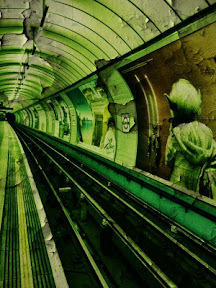 Looks kinda sci-fi, especially with Yoda in view. Love it!! What a fabulous picture. I have a fondness for all things tunnel, too.